No wonder I like the colors in Marina so much. They echo the colors in my gardens. The blue/green of the junipers, the light colors of the ornamental grass stems, the purples of the phlox and blues of the bachelor buttons. 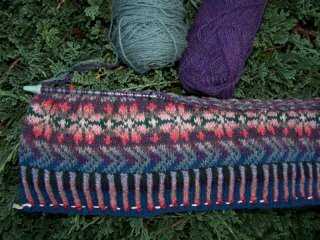 However, this knit is easier than the weeding. Up to row 28 and very happy with the ease of the design, colors and the way the Jamieson and Smith yarn is acting on the 3.25mm Inox circular needle. And yes, I know my arrows are pointing different than in the photo but who is going to know unless we have a room full of Marinas? The white cord at the bottom of the corrugated ribbing is simply to keep the rib from curling. Didn't want to steam the ribbing to flatten it out so just sewed it shut for now. Have to get a 20" circular in 3.25mm to keep going on the Shirt Tail Hemmed sweater. 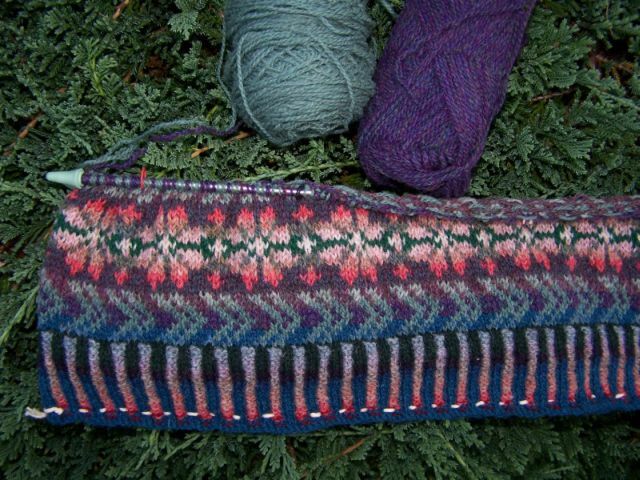 NO WAY am I ever going to knit Fair Isle sleeves on double points. Hmmmm.... road trip up to Camden and Unique One Knit shop and an overnight camp stay on the ocean edge? Great time of year for it as the leaves are starting to turn and the leaf peeper crowds aren't here yet.